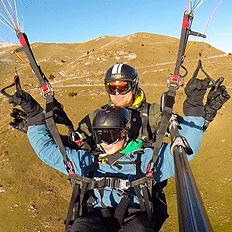 Enjoy the marvellous view to the Dolomites during a thermal flight on Alpe di Siusi. There are two couples of eagles which join us regulary when we turn around over thermal spots! We gain already altitude over the starting area of Spitzbühl, then we cross the valley and fly to Mount Puflatsch from where we see Val Gardena, Val d'Isarco, the Marmolata and the Sella Group. Puflatsch's black rocks help us to rise in the warm air. The flight continues by passing the Santner peak in front of Mount Sciliar back to Spitzbühl where we land or to the landing area In St. Valentino, Castelrotto. Thermal flights take place in the afternoon from 1 p.m. approximately, when the sun standing high permits thermal winds to spiral up to the clouds.